Introduction to Edible Plants in the Midwest — Learn. Survive. Thrive. Welcome to the 3rd part in our 5 part series on edible plants in the United States. This part will feature the Midwest which includes the states of, Ohio, Indiana, Illinois, Michigan, Wisconsin, Missouri, Kansas, Nebraska, Minnesota, and North and South Dakota. These states are known for their farming since they have such fertile soil. If you’ve ever been to any of these states, you probably remember passing a farm with some corn, wheat, or oat growing on it. Not only do they grow what is considered “cereal crops” but many edible plants grow there that you can eat throughout the year. The Serviceberry (Amelanchier) is a perfectly balanced sweet fruit. The best time to pick them is between June and early August. There are many different variations of this fruit, and they can be found on a bush or on occasion, a tree. None of them are poisonous but some, for example the Downy Serviceberry, can be dry and tasteless. When red, they look like Crabapples, and the bottom of the fruit resembles a flower that’s dried up. The leaves are oval, serrated, smooth, a bit hairy, and alternate along the stem. The flowers bloom in the spring, then towards summer, you will start to see the fruit appear. They have a similar taste of a cherry and a blueberry. Serviceberries are high in antioxidants, which can help prevent cardiovascular disease, strokes, cancer, and regulate blood pressure. Like green tea, serviceberries contain a lot of polyphenol, which can help prevent DNA damage, and it can slow down the aging process. They contain flavonoids such as, delphinidin, maldivin, cyanidin, petunidin, and pelargonidin, which are powerhouses against radical degradation, and diseases. On top of all of that, serviceberries can also help with inflammation, GI problems, and the seeds of the serviceberries can help soothe the mucus membranes in the mouth and lining of the lungs. Serviceberries are filled with vitamins A, C, K, E, B, fiber, magnesium and manganese. The best way to eat serviceberries is right off the tree. You can also put them in muffins, pies, soups, puddings, sausages, dried and then put into trail mix, and in jams. This may sound funny, but you can also put them into beer and cider. Some people even make serviceberry tea. You can find serviceberries in hedgerows and in open woodlands. Yarrow (Achillea Millefolium) is a perennial herb that comes in many different colors; from white to yellow to purple and pink. The yarrow grows 2 to 3’ high, with leaves that appear to be very thin and hairy but are lanced shaped and cut into very small segments. The leaves grow into a basal rosette and alternate up the stem. It blooms in the summer, starting in June and blooms through July. This plant has many health benefits, and can help almost every organ in the body. The yarrow can fight bacteria by increasing bile flow from the gallbladder; it also improves digestion, lowers cholesterol, and can prevent gallstones from forming. Yarrow can be used as a decongestant, since it has a drying effect. You can use it to treat eczema, and help promote blood circulation. If you find yourself in a world without access to proper medical care, yarrow can be used to stop the bleeding of wounds, and fight fevers. It can also be chewed to help relieve tooth pain. You can make teas; put it in the bath if you have skin irritations; put it out as flowers to help with sensitivity to environments, and since it has a bitter taste, you can incorporate it into beer. It has been said that it has a very bitter taste with a hint of warming spice. Since the yarrow prefers sunlight, you can find it in open fields. DO NOT ingest yarrow if you’re pregnant. The wild Bergamont, also known as the wild bergamot (Lamiaceae) is also a perennial herb found in the Midwest. 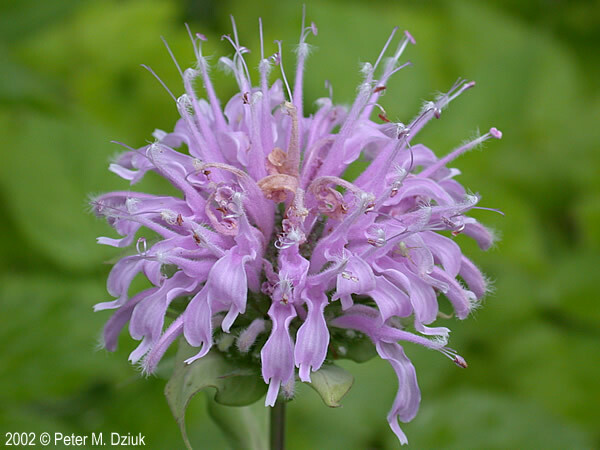 The wild bergamot is part of the mint family, and is two-lipped, tubular flowers that are on top of square stems. These flowers grow from 2-4’tall and bloom from July to September. These flowers range in color; from lilac (shown above), red, or pink. The wild bergamot can help with migraines, colds, bacteria, fungus, intestinal worms, stomach spasms, lowering blood pressure, and fever associated with the flu. It can also help with mild depression and anxiety. Externally, it can help with herpes simplex, burns, and warts. Wild bergamot is also high in vitamin A and C.
You can make a tea from the leaves, mix in with a salad, or can be used to season meat. It can be added to pasta and pizza sauce, and chili. The leaves and stems can be extracted in raw honey, and put on toast, or as a side with cheeses. Wild bergamot grows in dry thickets, clearings, and the woodlands edges. 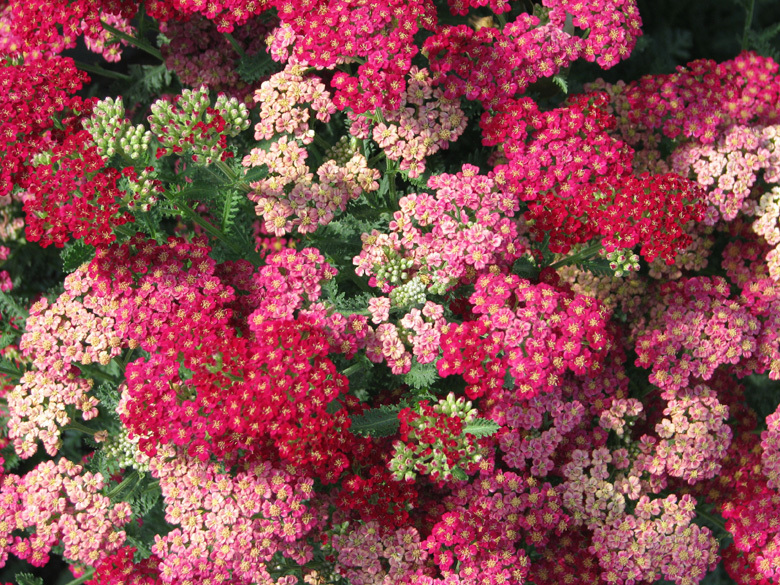 It likes dry to medium moisture, and it can grow in either full sun or part shade. 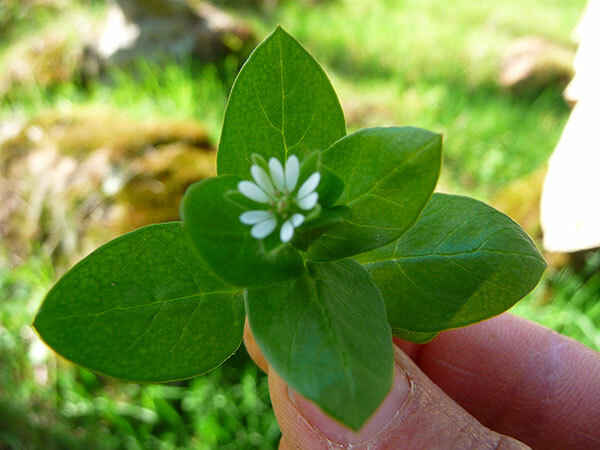 The common chickweed (Stellaria Media) is one of the few herbs that start blooming in the fall, grow throughout the winter, and finishes its seed production in the spring. Even though it looks like there are 10 white pedals, there are actually only 5. It also does an interesting trait called, “sleep of plants.” This term refers to the plant actually going to sleep at night. The leaves fold over the white pedals and new shoots until morning. The common chickweed is high in vitamin and minerals and contains Ascorbic-acid, Beta-carotene, Calcium, Coumarins, Genistein, Gamma-linolenic-acid, Flavonoids, Hentriacontanol, Magnesium, Niacin, Oleic-acid, Potassium, Riboflavin, Rutin, Selenium, Triterpenoid saponins, Thiamin, and Zinc. It can treat inflammation, ulcers, external abscesses, and boils. The common chickweed has been said to also treat asthma, blood disorders, conjunctivitis, constipation, skin ailments, and obesity. It can be added to salads, sandwiches, and tossed into stews and soups. You can also add it to a cooked dish for some extra flavor. The common chickweed can be found almost anywhere in the Midwest, but it’s found mostly in fields, pastures, waste areas, and forests. It’s also one of the most prominent weeds found in lawns. Alright Midwest, happy hunting! And as always, please be careful when hunting and eating edible plants! Stay tuned for part 4 in the series!